There’s no better way to start your day than with a good ride, Counsellor. First Broadcast: 1st May 1989. Posted in Season 2, TNGBookmark the permalink. I love the sci-fi premise of this episode where a whole planet-wide civilisation has been saved by a child who with youthful optimism / by complete accident manages to contact spacefaring aliens who are capable / willing to rescue their world. Yet neither the child nor anyone from that civilisation will ever know this child was responsible for the continuation of their existance, because her memory of the events were wiped. The Prime Directive protects natural selection. It protects the rights of every culture to work through its internal conflicts until it is ready for all the benefits of space. If the Enterprise D showed up in Earth’s orbit today to share it’s resources with us, we would benefit immensely while simultaneously sacrificing our right to go off world because we haven’t proven that we have what it takes to solve our own problems. Non-interference is a form of mutual respect that exists until the partners are on equal terms and share the ability to collaborate. Long live the Prime Directive. I think a big problem with this show in the first couple of seasons was the sheer variety of the audience they were trying to serve. I believe they were trying to get a really broad slice of viewers, not just the young SciFi fans and the young adult viewers, and they had to lard the series with all sorts of silly traditional crap to entice the non-SciFi sympathetic to watch. So they had the terrible silly stereotypical parts assigned to Troi, Riker, the business of the Apprenticeship of Wesley Crusher, and so forth—stuff the audience could readily understand—because they were writing for the same people that watched Dynasty and Falcon Crest and Matlock and Knightrider and Baywatch, not just the kids buying Marvel comic books. Add in the sheer chaos imposed by having to sometimes use old scripts meant for an older series (Star Trek, The Next Phase, was it? ), tight budgetary constraints imposed on any new “space series”, the Writers’ Strike, and having show runners who did not really know what they were trying to do (in my opinion), or even how much they could get away with, and you have this messy melange of story and sentiment. So dated, so often stupid and pathetic, so sexist, even at times racist, and so on. And yet when it manages to break free of those constraints, in small bits, it occasionally soars. Even in the first, quite ugly season, it introduces some new “outer-spacey” ideas to the screen, and that alone gives it some worth for me. I think all those dramatic elements we find so dopey now were the vital ones that allowed them to secure the money to put the show on the air, and keep it there. That made the pitch for the show explainable to people who knew little or nothing of SciFi or even Star Trek. Have you have ever heard of a TV exec of that era (or any, really, until perhaps fairly recently) that understood how to put a great SciFi show on the air, and not dilute its content at a moment’s notice? Anything you wanted to put on the screen you had to be able to explain to some high-strung executive who was always watching the bottom line, and wasn’t thinking about logical continuity or good character development—just how not to get fired. I think it is overall remembered as a great series because somehow it hung in there to achieve its third season, and continued to develop and hold us from there. 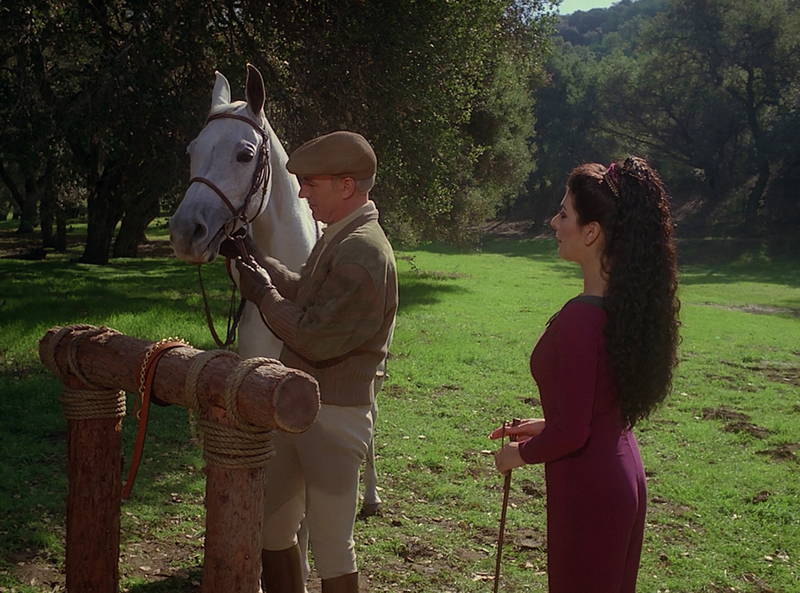 (And in spite of Deanna Troi, Wesley, Luxuana Troi, Alexander, and all the other known leaden bits.) The best of the story arcs and plot devices and characters, especially as regards the Klingons, the Borg, and the Romulans, is so strong that it leaves an overall impression in the mind that the whole show was great, all the way through, with a few wavering stories. Well, as you saw already, the first couple of seasons were often a waste of time, or damned close. The miracle is that Star Trek stayed on the air long enough to achieve that third season, which, as you have already remarked in earlier podcasts, would most likely not have been possible today. The Internet would have killed it in its first week. I could tell that you were getting fatigued from watching so much show content that is junk, I had a feeling you might be questioning your commitment to the big rewatch/podcast thing, because so much stuff you have consumed here, and remarked on, is such thin stuff—but I urge you to hang in there, and continue. The third season is so much better, things just start to click and cylinders start to engage in the big engine, and it becomes the series we all grew to love. Please hang in there if you can. I really like your perspectives and I would love to hear what you have to say as the better stuff starts to come along. And it will. PD is a direct reaction to the hundreds of years of Western imperialism that to this day still has devastating effects around the world. Europeans (and later Americans) marched into places where they had no sense of the culture, the people, the history etc. and deemed the people there to be “in need of help, in need of saving” and generally “inferior.” This arrogance, the belief that for some reason Europeans were the “better people”, led to centuries of strife, chaos and death. And this arrogance still exists today in many parts of the world, unfortunately. This topic is far to complex to delve into in a comment on a blog for a podcast about rewatching TNG. However, I would recommend that in the future, in the same way you guys have experts for specific scientific topics you want to discuss, you invite people who are experts in the history and philosophy behind ideas like Imperialism, non-intervention, etc. to discuss topics like the PD. Star Trek is much more than just science! Still love the show guys, keep it up! He most certainly would! Do not worry. We will return with fresh episodes very soon, and can’t wait to get to Season 3!!! Hope you guys have some new episodes coming up! I just caught up to you and miss hearing your take on each episode as I watch them! Yes, sorry for the delay. Our return is imminent! Yes, apologies for the delay. We have been on hiatus while Rob was starting his new job and moving house, and I was trying to replace him in his old position and having to learn a lot of ropes! We have a few episodes recorded that I will be releasing very shortly. There is no way in hell we are getting to the end of Season 2 and stopping there! Thanks for your interest, we really hope you keep listening to and enjoying the podcast! Should we expect some more long delays between podcast episodes after the next few are released? Just nice to know in advance when to expect delays. Great news!!! Thank you for updating! I have tried other tng podcasts in the meantime and they just don’t measure up! Looking forward to hearing more. Good luck to Rob in his new job!